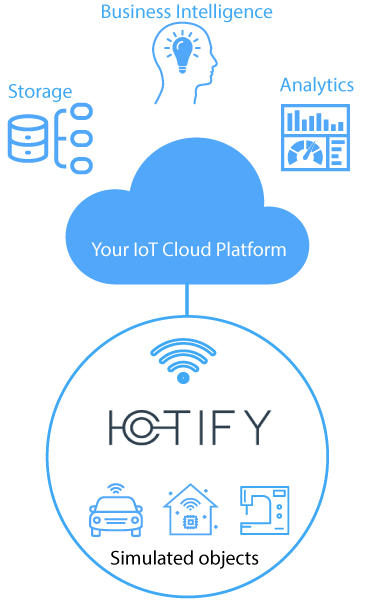 IoTIFY is your cloud based intelligent device simulator and load testing solution for IoT platforms. It enables rapid IoT Application development by simulating virtual devices in the cloud. IoTIFY provide intelligent IoT system simulation on the cloud, which makes it super easy to develop a large scale Cloud-based IoT Application. Our Rapid IoT application development environment helps you prototype, scale and manage your IoT application with ultimate flexibility and ease. Following diagram illustrates IoTIFY positioning in your IoT development ecosystem. Using IoTIFY, you could quickly turn an idea into a prototype, then scale from a single IoT endpoint to hundreds of thousands using our Network Simulation tool. IoTIFY simulates devices, so you will need a cloud platform to connect our simulator to. We already support a majority of the cloud platforms right out of the box. Once this template is run by our system on a predefined interval, we will call this function every time and send the generated returned value to your cloud platform. Above is a very simple example of how the basic templating works. If you would like to learn more, have a look at the detailed guide here. E.g. You could even simulate a device to device interaction such as a simulated light bulb being controlled by a simulated light switch. Templates are also bidirectional, i.e. they enable you to react to messages received from the cloud platform. Know more about this here. You could pack as many features and functions to your template and make sure that your simulation covers the entire spectrum of device behavior. Once the simulation is finalized, its time to run a full system simulation at large scale. Step 3. Full system simulation and performance testing your IoT platform. Almost every cloud platform promises millions of IoT endpoints, but how many of them actually deliver and at what cost? Launching a full system simulation with iotify is very simple. Just specify the number of devices you would like to simulate and we will take care of the rest. Find out the operational cost of spawning additional capacity to handle the load. When should you use IOTIFY? Your hardware teams are running behind schedules and you want to get started with your IoT cloud application development. Do you have any real world examples? Develop comprehensive application for smart city waste management, or monitor energy usage using our network simulation tool. Looking for quickly prototyping an Idea? Follow the Hello IoT guide to understand how could you use IoTIFY as a rapid prototyping environment. Time to stress test your MQTT/HTTP backend? Use Network Simulation for a detailed step-by-step tutorial of deploying virtual devices to the live system in production environment. Looking for way to generate data? Follow the Database guides for generating massive datasets for static analysis. The tools provided by IOTIFY gives you immense flexibility to create any IoT network. You could even build your own Smart City simulation. And finally, if you any other question where you need expert advice, we are here to help. Drop us a line to see how could we help. Sounds exciting? Get yourself familiar with the templates first and then straight down to examples. IoT is a collaborative effort. Join our slack channel or fork our github repos and start sharing with the community!